Voters in the Netherlands have backed two pro-European centrist parties, while the anti-immigrant Geert Wilders’ Eurosceptic party took heavy losses. 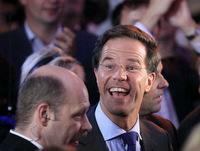 Prime Minister Mark Rutte claimed victory for his liberal VVD party. Centre-left Labour came a close second. Both parties performed better than predicted, seeking a pan-European solution to the eurozone crisis. Mr Rutte said he was working hard to form a coalition but would not be drawn on whether he would approach Labour. The two leading parties have enough seats between for a workable coalition — but would have to reconcile very different views on austerity. The VVD took 41 seats in the 150-member lower house, two more than Labour. Dutch voters returned to parties of the centre, following recent elections which produced highly fragmented results and multi-party coalitions. The Socialist Party, which briefly led in opinion polls, came joint third with 15 seats, the same result as at the 2010 election. German Foreign Minister Guido Westerwelle said the election outcome strengthened Europe and weakened populists and nationalists. Formal talks on forming a new government cannot start until next week, after the election result is officially confirmed. Labour Party leader Diederik Samsom, who has advocated spending on job-creation programmes, indicated he would bargain hard in coalition talks. «Nobody knows exactly what will happen tomorrow, but one thing is certain: the course can be changed,» he said. Mr Samsom’s approach has been broadly seen as a nod to the policies of France’s recently elected Socialist President, Francois Hollande, who wants to increase spending and raise taxes on the rich. Mr Rutte’s policy echoes German Chancellor Angel Merkel’s plans of strictly adhering to austerity measures that are designed to force down the country’s deficit. Analysts say the outcome will be significant for Germany’s campaign for fiscal discipline in the eurozone. The election was called after the Freedom Party withdrew its support for Mr Rutte’s budget cuts six months ago.